Obesity is a condition that occurs when a person weighs much more than the healthy range for his or her age, gender, and height. Being obese is different than being overweight — it is a more serious condition and can lead to complications in one’s health, wellness, and everyday life. Both locally and across the country, childhood obesity has become a growing problem and is putting kids at risk of poor health. Between 2011 and 2014, about 17 percent of children in the United States were obese and this rate was the same in New York State between 2012 and 2014. 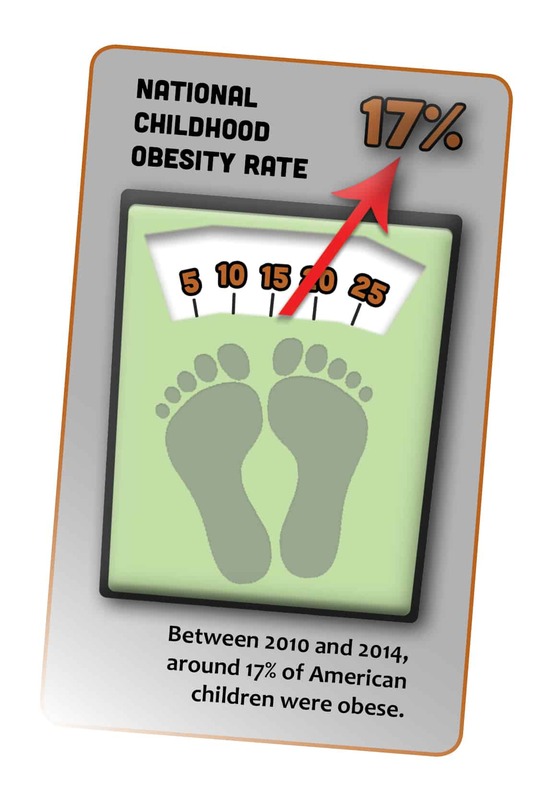 That means nearly 1 in 5 children across the country are obese! Childhood obesity is a direct risk factor for type 2 diabetes and other chronic diseases. It also greatly increases a child’s risk for obesity in adulthood, which can lead to cardiovascular disease, diabetes, several kinds of cancer, pulmonary disease, sleep apnea, metabolic syndrome, and muskuloskeletal disease. Additionally, obesity can decrease one’s quality of life by limiting mobility and other functions. Obesity is particularly concerning for children, because its harmful effect on the body becomes more serious as a person ages. If a child remains obese into adolescence and adulthood, he or she will likely have irreversible health concerns and a shortened life expectancy. What is the right weight for my child? Just like adults, children come in all shapes and sizes. They also grow and develop differently from one another. Therefore, it is important to keep in mind that a healthy body weight for one child may not be the same as a healthy body weight for another. A child’s age, gender, height, body type and genetic makeup can all make a difference when determining what weight is healthy for them. The most widely used and recognized scale for measuring a healthy body weight is called the body mass index, or BMI for short. While it is not perfect, the body mass index uses a person’s height and weight to estimate how much body fat they have. A child’s body mass index may change drastically as he or she grows and develops. To find out your child’s body mass index, click here. Jefferson, Lewis, and St. Lawrence counties each had rates of childhood obesity higher than the New York State average between 2012 and 2014. 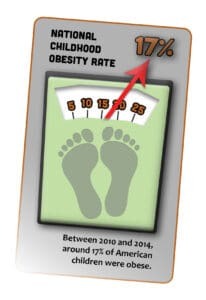 In Jefferson County, 19.7% of children were obese, as were 22.6% in Lewis County and 22.5% in St. Lawrence County. Across the region’s primary and secondary schools, 2,718 students are obese. 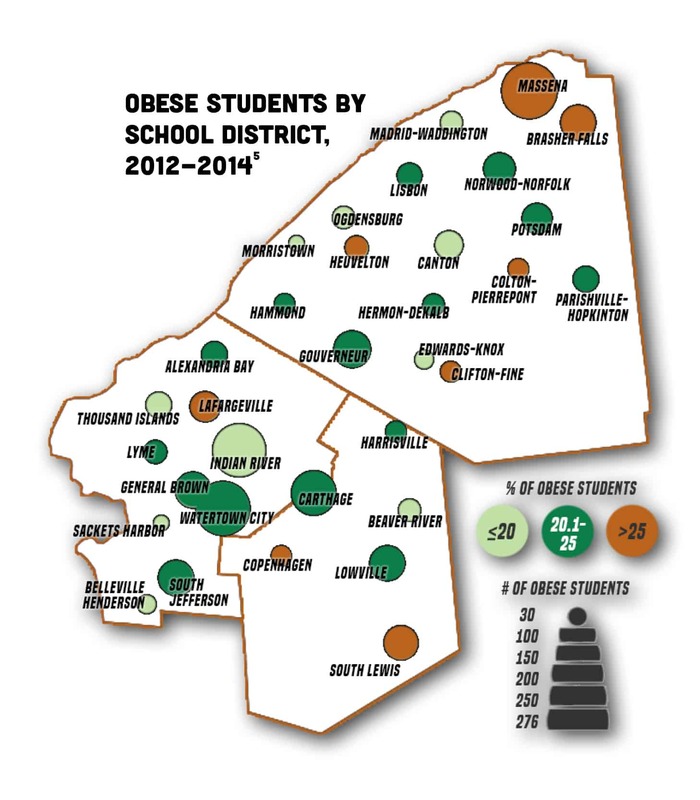 Below are the 10 school districts in our region with the highest rates of obesity, with the number of obese students in each school in parenthesis. How often does your child eat after 7 p.m.? Does he or she eat slowly, or very fast? Does your child stop eating before feeling full, or after? These are all important questions to pay attention to — not just for your children, but for your own health as well. Paying more attention to what, when, why and how your children eat can prevent them from overeating and reduce their risk of obesity. Click here for more information. Without a doubt, the most important part of living healthy is making sure you and your child have proper nutrition. Not only do healthy foods help children avoid obesity, but they also help them to grow and develop properly. Better yet, get your kids involved in the cooking process and be a role model by eating healthy yourself! For tips and advice, click here. Exercise is an effective way to fight obesity, and it doesn’t have to be fast paced to make a difference. Taking walks with your children on a daily basis will help them to stay healthy and give you time to connect as a family. By showing your child that physical activity is important each day, they will develop their own fitness routines as they age into adolescence and adulthood.